During Easter, markets and exchanges around the world are closed at certain times. Global Trading’s operating hours over this period are given below. Please note that even during these hours some markets and exchanges may not be available. *May be subject to change, depending on liquidity providers and venues. In April, we will be launching a major upgrade to the Product Overview pages in GTS and these pages will be made available in GTS Pro. The overview pages will continue to offer an in-depth overview of the instrument selected in the watchlist, positions list, order list or through the global search function in the platform. More sections with more information are planned in the near future. In April, we will launch an Option Strategies trade ticket in the GTS desktop and GTS PRO platforms offering multi-leg exchange-traded option trades. In April, we will be launching a new FX Exposures module in TraderPRO which will give a detailed breakdown of your net FX exposures by currency. The FX Exposures module will be available from the TraderPRO Menu as a module that you can dock in your workspace. FX Exposures shows a breakdown of net position by currency for a selected account or group of accounts. Customizable columns offer sorting by currency, exposure in account currency or exposure in USD. Exposures can be itemized by trade, P/L and cash components of the exposure. The FX Exposure module also displays your exposure limit for each exposure currency the % utilization, and your total FX Net Open Position (NOP) exposure limits. From April, an enhancement to the search will be available allowing you to refine searches by for example product, currency, country and sector and will allow you to sort results by product, popularity or alphabetically. 2- and 3-minute chart intervals are now available on charts in the TraderGO and TraderPRO platforms. These can be added to the Period selector in charts by clicking the Customize link in the selector. As previously announced, Equity Research will be discontinued in April 2019 and the Equity Research and Stock Screeners will be removed from all platforms. Please contact [email protected] if you have further questions about these changes. We are implementing a new equity risk rating model on the March 10th. These changes will impact single stock CFDs and short stock option position margin requirements, and where applicable, the collateral for cash shares/ETF positions. You should be able to see all the scheduled changes and how they could impact current positions in the platform’s ‘Margin Monitor’ tool. The tool can be accessed via the ‘Info’ icon, under ‘Account Summary’. Clients that could have been exposed to a large margin usage swing have been contacted individually. From 19 December 2018 we have implemented a small but significant change to the way that we handle FX trailing stop orders. -Trailing stop if offered orders to sell will now follow the bid price (previously they followed the offer). They will continue to be triggered on the offer price. -Trailing stop if bid orders to buy, will now follow the offer price (previously they followed the bid). They will continue to be triggered on the bid price. Previously, where a trailing stop if offered order to sell followed the offer price, spread widening would result in the stop order being dragged higher by a temporary spike. When the spread returned to normal levels, the stop order would then be triggered resulting in unexpected trailing stop behaviour. We have therefore made this small change to protect clients from unexpected order fills as result of spread widening around market volatility or market opening e.g. Sunday open. Extra Bars is a useful new feature that allows you to create space between last updated bar or candle and the y-axis, adding space for projecting annotations into the future. You can add space from chart configuration menu available from the right-click menu (desktop) or the chat settings icon. Chart annotations are now remembered for each instrument and will be available whenever you open a new chart for the instrument. If you have several instances of a chart open for the same instrument, the most recent changes to the chart annotations will be used. If you zoom or pan in the chart, the chart now persists the time range if you close and reopen the platform, detach the chart or select another instrument. If I pan the chart to show a time range of 2016 – 2017 for example, opening a new instrument in the chart will show the time range 2016 – 2017. Click on the Reset icon to quickly reset to the time range selected. The calculation behind the Volume Weighted Average Price (VWAP) indicator will be improved to more accurately display the average weighted price by volume – the value of all trades in a trading session divided by trading volume. VWAP is similar to a moving average with a lagging indicator used on intraday time periods only. Contrary to the moving average, VWAP accumulates volume throughout the trading session. VWAP can be used to compare the current price to the VWAP value to determine the general direction for the instrument – if current price is below the VWAP line prices are falling, if above prices are rising. To improve the readability you will be able to add colours to the x-axis to make it easier to quickly identify different trading periods. From February, an option will be available in the Trade Ticket when placing orders, allowing you to simplify the order types, hiding complex order types and limiting the list to Market, Limit and Stop orders used by most clients. A number of design updates to GTS Mobile will be released in the coming months. In close contact with clients, we have been making a number of usability improvements to the mobile trader. Most notably we will increase the font sizes and certain navigation buttons and icons to improve legibility and navigation. Font sizes will also be increased on GTS Mobile on the desktop. A number of enhancements will soon be released in the GTS Pro platform allowing traders to more efficiently navigate the platform using the keyboard. From February 2019, FX stop orders will be simplified where Stop if Bid and Stop if Offered will be labelled Stop orders throughout the platform in trade confirmations and order and position lists. Similarly, Trailing stop if Bid and Trailing Stop if Offered orders will be labelled Trailing Stop orders. These orders will continue to be placed and triggered in the same way. Corporate Action Notifications will be provided on mandatory events for Stocks, Bonds and Mutual Funds. Clients can access this information under Account > Other > Corporate Action Mandatory Events. Events will be shown until their Ex date/effective date + 30 days. Equity Research available through the platforms will be discontinued in April 2019. We are working on a replacement for this service which will be available before the Equity Research is retired. Due to a deterioration in the underlying liquidity available in XPDUSD, we are no longer able to support trading in Palladium/USD. From Monday 21 January 2019 clients are no longer be able to open new positions in XPDUSD and by Friday 15 February 2019 all existing positions must be closed. After this date, we will close all open positions and cancel any open orders on your behalf. Please note that should you wish to gain exposure to Palladium, we continue to offer trading of Palladium CFDs and Palladium (PA) Futures. On Wednesday 21 of November 2018 at 08:00 GMT we will be implementing new standard margin rates for FX and CFDs. These margin rates will remain in effect until further notice. These margin rates will remain in effect until further notice, as we continue to monitor the geopolitical and market situation closely. What will the margin rates be? The following tables gives you an overview of the affected instruments on your account. You can check the upcoming changes to margin rates and collateral requirements for your respective margin profile in the trading platform under ‘Account – Margin and Collateral’. Since Monday 22 October, the new ‘Margin Monitor’ feature is be available in GTS Web and GTS Pro, to complement the existing Margin and Collateral changes module. This provides an overview of the positions that are affected by margin changes, and shows the current and the simulated margin after all changes have been applied. The Margin Monitor will be available through an icon on the Account Toolbar (on the Account Summary in GTS Pro). The Margin Monitor is also available in My Account. How does this impact your trading? If you have open positions in any of the affected markets, please ensure that you monitor your positions carefully and maintain sufficient funds in your account to meet the increased margin requirements during this period of turmoil. Please be advised that we are no longer going to be supporting Nasdaq OMX Nordic Equities Subscriptions due to changes in the Nasdaq OMX Nordic Equities exchange licensing policies associated with this subscription. Existing subscriptions will be terminated and the ability for clients to subscribe to this exchange as non-professionals will be removed. Professional subscriptions have been removed on Aug 1st 2018 as previously communicated here. Instruments on OMX that show zero on the price are supposed to be still tradable. Please be advised that we are no longer going to be supporting Nasdaq OMX Nordic Equities Professional Subscriptions due to changes in the Nasdaq OMX Nordic Equities exchange licensing policies associated with this subscription. Existing subscriptions will be terminated and the ability for clients to subscribe to this exchange as professionals will be removed. Private subscribers can still apply for the real-time subscription as usual. The following table provides indicative rates for withholding amounts on equity and interest income associated with equity and bond purchases made at Euro Pacific Securities (Global Trading). Rates are subject to change. This table is informational purposes and is not guaranteed as to accuracy. The new navigation makes it fast and easy to access the main components: Account Summary Watchlists, Positions and Orders in a single tap. Other functions are accessed through the menu icon. The Watchlist, Positions and Orders sections have been redesigned to offer a simpler layout, with easy access to detailed information through the use of info card which appear when you select an instrument. The info cards allow you to swipe between key information for the position or order, a chart for the instrument and key market information for the instrument. The Account Summary was also redesigned to give an overview of all accounts and easy access to details on a particular account. The new Trade Ticket has recently been introduced which is optimised for easier navigation and use on mobile devices with more touch-friendly controls. Many other new features are coming to the GTS Mobile soon. Trading in a second currency is now available in the GTS Web. FX Quick Trades in the GTS Web now have a currency toggle on the amount selector, allowing you to select a second currency and set trade amounts in a second currency (the quote currency). 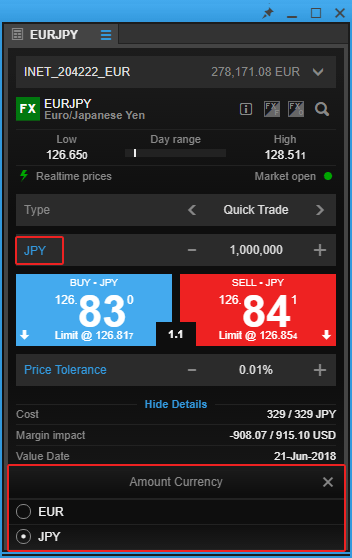 In this example, the Amount would normally be placed in EUR but you can now select to place the trade in JPY which will be converted to the EUR amount when you place the trade. Please note that this is for convenience in converting trade amounts from the quote currency. The trade amount will always be placed in the base currency (EUR for EURJPY in this example). Effective Monday, 9 July 2018 Global Trading LTD will improve the order checking of futures and options orders, so that the initial margin is used for the entire portfolio. The change only relates to pre-check of futures and futures options so clients without positions in these instruments are not affected. A new Aggregated Amounts tool is now available which exports aggregated amounts for your holdings into an Excel sheet. These include daily exposures, position values, P/Ls, costs and bookings and allows you to filter and process these amounts based on your own use cases. Aggregated amount is available under Account > Historic reports > Aggregated amounts in the platforms. Improved trendline annotations are now available in the charts in all platforms. A number of changes have recently been made to the trendline annotation, available from the Annotations menu in the chart. The Trendline annotation has changed name to Trendline Segment which still draws a line between the two points on the chart. Infinite trendline has changed name to Trendline Ray and still extends in one direction (forwards). A new trend line named Trendline Extended is now available which extends to both the left and right. This change separates the margin impact from impact of costs and option premiums. From 1 August 2018, Australian Securities Exchange Level 2 subscriptions will be raised from AUD 82 to 88 for professional clients. Please be advised that we are no longer going to be supporting Dow Jones and S&P stock indices subscription due to substantial increases in pricing associated with offering this subscription. IMPORTANT: These are just the non-tradable stock indices, not exchanges. All US equities and derivatives and the DJIA and S&P Index derivatives, such as options on these indices currently offered in the platform will still be tradable. Please contact trading support ([email protected]) if you have any further questions about these changes.